VIEWER ALERT: This report includes a photo that may not be appropriate for all readers. Discretion is advised. CEDAR CITY — A little over a week ago, Chelsey Austin’s boyfriend came home just before lunch to find their miniature pit bull Leroy and miniature dachshund Dudley dead in their yard in Leeds. After determining the dogs died from snake bites, Austin said she wanted to make sure others are aware and take steps to prevent similar incidents, both for pets and people. On the morning of the incident, Austin said, both dogs had been put on long chains underneath a shade tree before she and her boyfriend left for work. When her boyfriend returned to meet with a repairman at about 11:30 a.m., he found the two dogs. “They were laying next to each other under the tree on their sides,” Austin said. The couple’s first reaction was that the animals had been shot by a shotgun, due to several small holes in the dachshund’s side. However, it was later determined by closer examination that the signs — including the dogs’ faces being swollen and indication of internal bleeding — pointed to the fact that the dogs had been bitten by a rattlesnake. Additionally, Austin said when police were called to determine if a human was to blame for the incident, the officer interviewed a neighbor who said she heard the dogs barking a lot for a moment, which Austin said wouldn’t happen unless someone or something was in the yard. 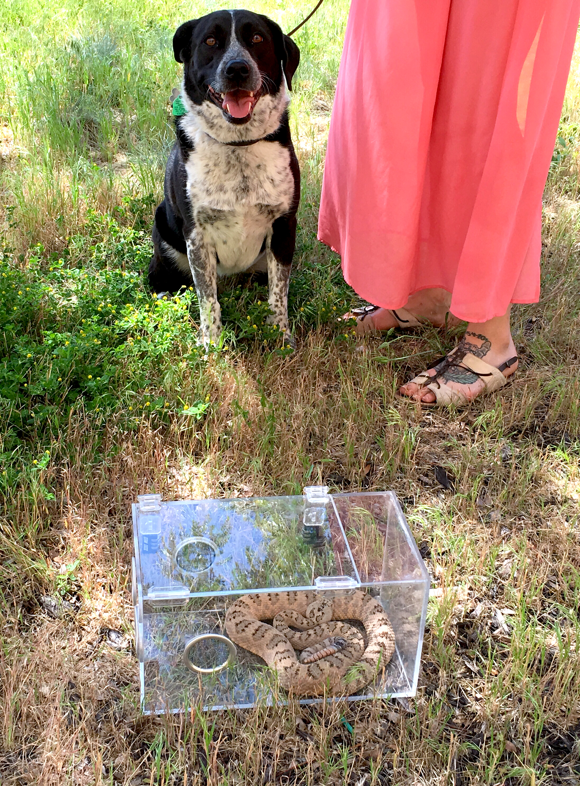 Haley Bechard, who runs Utah’s Rattlesnake Avoidance in Sandy and says she loves reptiles as much as she loves dogs, told St. George News barking is a good indicator that a dog has located a snake. Bechard has several years experience working with both reptiles and dogs, first as the head reptile keeper at Scales and Tails Utah and most recently with Utah’s Rattlesnake Avoidance, which offers dog training classes using live rattlesnakes and providing a safe and humane way to protect both dogs and snakes. Bechard doesn’t currently offer classes in Southern Utah; however, she said, if enough people contact her expressing an interest, she would consider traveling down for a training session. In the meantime, she offered a few suggestions and tell-tale signs to pet owners when it comes to rattlesnake safety, especially for people taking their dogs with them on walks or hikes. In addition to hearing barking or yelping as indicators of a dog’s encounter with a rattlesnake, Bechard listed sudden lethargy in animals as a potential indicator. If the dog has disappeared for a few minutes while on a hike, Bechard said, it is a good idea to give them a once-over looking for any puncture wounds or swelling. No matter what, that is your strongest suit. Your dog can never be off the leash without it. If your dog cannot ‘leave it’ and come back to you, your dog is at a danger for a lot of things. It is also a good idea to be familiar with your surroundings and aware of rattlesnake behavior patterns, Bechard said, including a snake’s tendency to be out in the early morning or evening for hunting. Otherwise, rattlesnakes will seek cooler areas, such as shaded areas or under rocks. In 2013, St. George News reported on a “rattlesnake vaccine” available to pet owners; however, if you haven’t done that and your dog is bitten, Bechard said, try to keep the dog calm and the wound clean. Austin said ever since the incident with her dogs, she and her boyfriend are taking steps to discourage more rattlesnakes from coming into the area, especially as she has three children. While Division of Wildlife Resources experts have told her not to bother wasting money on rattlesnake repellent sprays, she has purchased rodent repellent as a way to minimize potential rattlesnake food supply in the area. She has also started working on clearing the brush around her property. Rattlesnakes are fully protected by Utah law. It is illegal to kill or even harass one. If a rattlesnake is in your yard, try to remove it by spraying it out of the area with a garden hose, while staying at least 15 feet away. If the hose doesn’t work, do not try to remove it yourself. Contact animal control or the DWR office closest to you. In St. George, call 435-879-8694; in Cedar City, call 435-865-6100. The mortality rate from rattlesnake bites for most people is very low, Bechard said. However, once bitten, a person should seek medical attention as soon as possible. If treatment is given within two hours of the bite, the probability of recovery is greater than 99 percent. 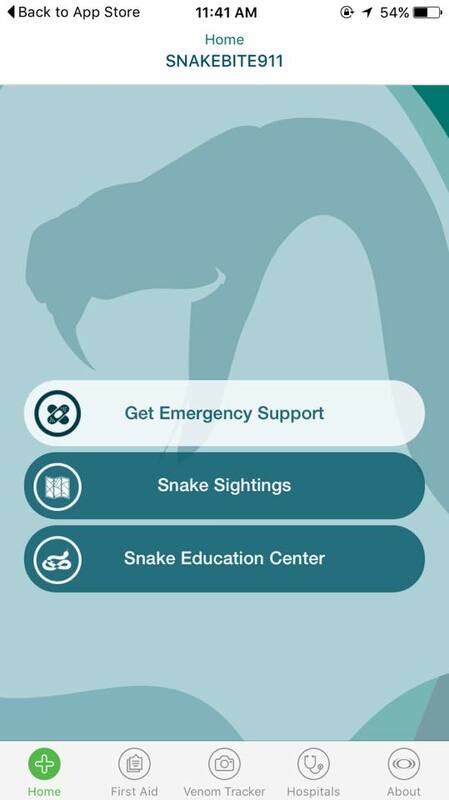 In order to assist hikers or people in rural areas, Bechard said a venom lab in Salt Lake City has developed an app called “SnakeBite911,” which offers snake education, first aid information and directions to medical assistance. SnakeBite911 is only currently available for iPhones, Bechard said, but developers are working on the Android version. Here’s a thought. Don’t CHAIN your dogs so they can’t escape. 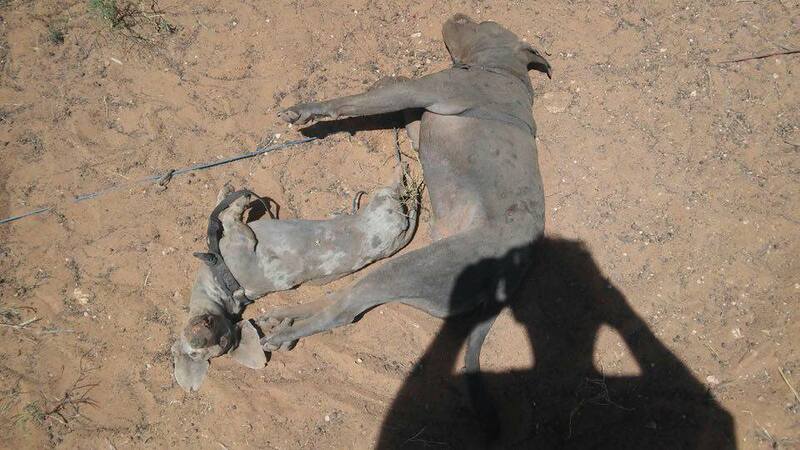 Also, don’t leave your dogs CHAINED OUT in life-threatening HEAT. Too lazy to train your dogs to be able to be inside your house?? If someone else had not already said it, I would! I am sorry for the loss of your dogs. It is the responsibility of the pet owner to ensure the pets safety at all times. Whether or not they were chained up the end result could have been the same. However, having outside animals does expose them to greater risks. So sad. At least there is some comfort knowing they were together and not alone. I am so sorry for the loss of your furry kids. I also am an owner of a Doxie and a Chihuahua, and they are so bonded, as I feel these two in the photo were. However, I have to agree with Accountable above and wonder, why on earth would you leave the dogs outside, chained up in this horrible heat we have been having for at least 2 days?? It’s not like it just got so hot in the last 24 hours and you weren’t expecting it. Laziness and/or irresponsible pet ownership is to blame. Chaining up a dog outside is plain irresponsible behavior on the part of the owners. Shame on you. I just hope you aren’t the type of parents that would leave your kids in the car on such a hot day while you shop. Small children and pets cannot advise you of their suffering if you are not willing to try to know them well. Please do yourself and other dogs a favor….don’t replace your dogs if you can’t take the time to train them to leave them in the home while you are gone. Better still, invest in a mongoose. Read the first sentence in the story Ron, A little over a week ago!!!!!! You can read, right? Leaving your pets chained with “a bowl” of water ANYTIME during the summer is abusive/inhumane. I hope you can read and comprehend what we’re all saying Chuck. But, just in case you’re as thick as I believe you are: we have every justification for calling out these pet owners for their treatment of these two dogs. Period. Chuck, I don’t care if it was last week, or two months ago, or yesterday. Lets chain you to a tree with a bowl of water for 8 hours. Or better yet, lets chain up one of your kids outdoors while you go to work. After all, it’s only for 8 hours, right?? It is not bad enough that these guys lost their best friends but you need to pass your illiterate judgement upon them? Shame on you! Maybe we should offer them a fund raiser? Don’t you ever get a bit sick and tired of people who are too stupid to actually think about what they are doing? “illiterate judgement”??? ?……you are talking about the shameful dog owners in this story, right?? Judgment is spelled J U D G M E N T Chuck. It means the ability to make considered decisions or come to sensible conclusions. Before you pass judgment on other people’s illiteracy, be careful not to show yours. Same goes to you accountant!